Hi everyone I'm Jack Red, I had close to an handful of Interplay games growing up. I heard a lot about them as time went on. Just before I considered this bundle, the sudden news of Interplay selling everything was sad. I figured to get Interplay Build Your Own Bundle before that happens. They give you close to forty games to choose from. You get to pick ten games to get all of them 90% off. I picked some games I had an connection with while others caught my attention. Despite the title this is an compilation of three games. You get Battle Chess, Battle Chess II: Chinese Chess & Battle Chess 4000. The entire original Battle Chess series played through an DOSBOX emulator. All three games has an unique appeal for many reasons since all their themes are more different from each other. Battle Chess is medieval while Battle Chess II goes Chinese dynasty to finally Battle Chess 4000 futuristic space theme. As many of you expected, you are playing three different styles of chess. Surprisingly great AI in DOS games to constantly push you to do better. What made these games so famous in the first place was the level of violence. In regular chess when an piece is took down, they are removed from the board that's it. But in these games every time this happens, you get to watch entertaining battles with death scenes involved. Some of these are strange but it has some good humor. There is all kinds of possibilities to keep you coming back to play more. It's difficult to believe there exist not only an Star Wars game inspired by this but also an Terminator game as well. I recommend looking up the rules for chess & Chinese chess in advance. Unless you prefer to play things by ear. Let's get this out of the way Battle Chess 4000 does use claymation similar to ClayFighter series also owned by Interplay. I felt it had the weakest overall design as most death animations weren't as entertaining as the first two games. I can't help it that you get two identical guys on both sides that looks similar to Toy Story's Buzz Lightyear. Sometimes I have trouble making an move. Which barely happens in the first two games. I do like it's clocking how long all my turns are as well as those of my opponent's making it like competitive chess in real life. I wasn't too crazy for all the characters designs in Battle Chess 4000. Honestly for me it's very close between the first two games. If I had to pick one over the other, it has to be Battle Chess II. An very unique take on Chinese chess that ends up being surprisingly entertaining. This game nails everything the original does but simply done better. As an whole one of the best among my set for this bundle. These games aren't for everybody but those who like shooters or parodies like these or just want something different. I will recommend these weird yet good shooter series to you. Earthworm Jim 3D is known as one of the absolute worst video sequels in history. Everything about it is so hilariously bad that I refuse to keep playing it. Especially despite what it took from the first two games. You really can't help noticing how incredibly different it is. 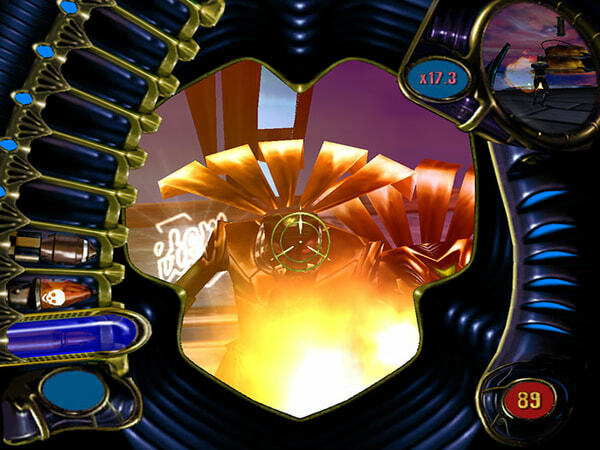 Banjo-Kazooie: Nuts & Bolts has an similar problem but an much better. At least that took parts of what made the first two games such an hit. Earthworm Jim 3D was made by an different team to create an full 3D Earthworm Jim game. Interplay wanted it to be similar to Super Mario 64 & Banjo series. The team clearly didn't pay attention to what made Earthworm Jim series an hit. What's worse is this originally got released on N64. I am playing it's PC port which isn't much better. According to many people it's worse but that's debatable in and of itself. The boss fights are all the same, all you have to do is collect an hundred orbs. You can do most of it without attacking the bosses until you have to. For me an boss fight should be you against them with real challenge. No real way around it, you take them on. Plus it really would help if all of them were different. Earthworm Jim 3D is so amazingly bad that I almost didn't pay it. Officially considering the bundle I basically got this for free. This game is just an cheap rip off of much better N64 platformers. The original team was pissed that they couldn't make this game. To date this move was one of Interplay's worst. You would think the gold stuff you're collecting opens levels & bosses right? No simply collecting regular marbles does that makes those gold things useless. I will say for those who enjoy or test their skills by playing bad games. You think you play games than by all means play games like this or Superman 64. I am not kidding it's almost as bad as Bubsy 3D on PlayStation. This is what happens when you change the teams with as little information and tight schedule. I knew about this game for many years. I didn't know until after seeing it among the selection of games for this bundle that Interplay owns it. Like many shooters having parody of movies. Shogo decides to take inspiration from mech animes like Gundam, Neon Genesis Evangelion & Robotech. I am going to be straight with you that I have a lot to cover with this game both good & bad. This was release an month before Blood 2: The Chosen with striking similarities. Just like Blood 2, Shogo does share some of it's issues. For example some of the absolute worst AI I ever seen. Their aim is deadly with an critical system affecting everyone is both an blessing & an curse. You could gun them several enemies much easier but they can do the same to you just as quickly. Both your character & mech get their own weapons which I like a lot. Some are mixed about why both of them play so similar even with differences considered. Some made an great point that back then no one nailed mech games that go into between several game play styles. Honestly I am happy with what we got. The story is okay with average voice acting. With the possible exception of people screaming, most sounds in general are excellent. All people models are heavily dated for it's era but I love all mech models. Most levels are short but easy to memorize. 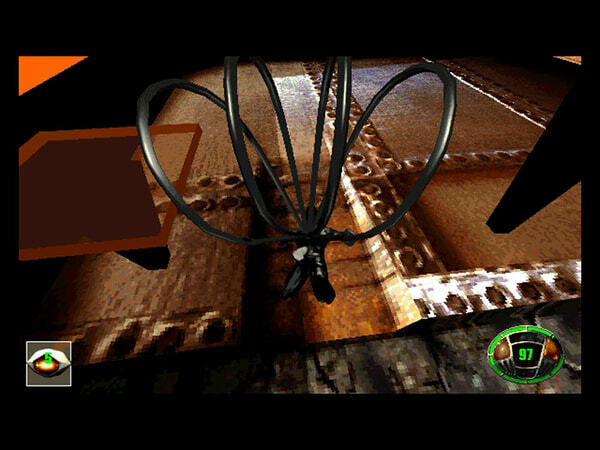 A few levels you will visit a few times but unlike Blood 2's train level. They made sure to keep it refresh to an degree. This also has two endings that determines who will be your final boss. Regardless both of them are real possibilities that could happen. I honestly didn't care for the main character. Sorry guys it's true, I find him boring & annoying most of the time. Most bosses are almost the same that is disappointing. How each level plays into their respective objectives does work a lot better than that of Blood 2's. This is one of my favorite games in the bundle. Shogo is best played either taking your time without cheating or go in gun blazing with codes. Both take time to get to but I recommend both ways of playing it. Very limited amount of enemy types compared to so many shooters. Roughly an handful that's it seriously go count them yourselves. 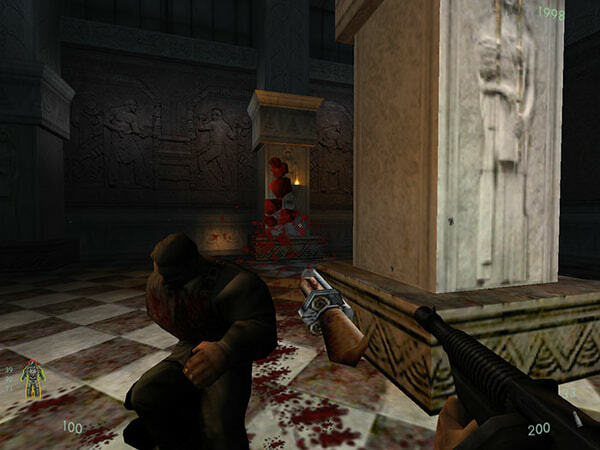 I do like this more than Blood 2 but this is on the thin line of what I would rank an game. Can you believe the same company who made Superman 64 had good games? Yes it's true because an short lived game series called Prehistorik was among their most popular games. Surprisingly both these games are very different each other like comparing Duke Nukem 2 to Duke Nukem 1. Prehistorik 2 is an solid platformer that's still fresh today. Not everyone will enjoy Prehistorik 1 due to it's controls take longer to get use to. Both has great sound tracks with amazing sound effects for their time. For the most part you get from point A to point B. Both games has a loose hit system with barely any invulnerable period between hits. I grew up with an Genesis game called Chuck Rock which is similar to these games. Prehistorik 2 does have an password system. I felt if Prehistorik 1 had one, it would make the game a little bit better. If you were growing up in the 90s. Chances are you probably heard of Earthworm Jim. An forgotten video game mascot whose success was short lived. 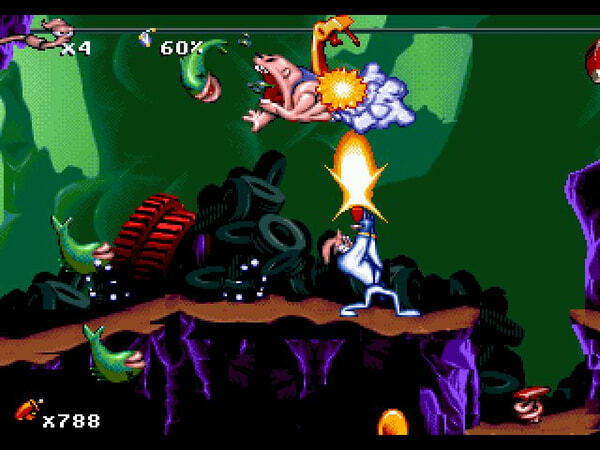 Earthworm Jim got an hand of games and an cartoon during the high of it's popularity. The first two games were originally released on Sega Genesis. Still to this day two of the most popular among Interplay's games. Both of these games were amazing for their time. Controls in this version of both games does take time getting use to. Trying to change the controls can be challenging. Honestly both of them are very solid platformers that more people should play. Some of the weirdest level designs & bosses you will ever see. Earthworm Jim has an strange sense of humor that not everyone will get. What I really like about this port is both games has an password system. Of course not everything made the trip from Genesis to DOS well but considering the natural of these titles. I still give them praise for getting them there. Also I am not saying these are bad ports because they aren't. These are some of the finest within Interplay's collection of games. Honestly considering it's engine was already technically dated for it's time. The team behind this still made an very good game. All levels look more realistic compared to Quake with most characters being very well designed. Great controls with interesting game mechanics to keep things fresh & addicting. It is easy to cheat which makes Kingpin a lot more fun to play. Sometimes you will get confuse where to go or what to do. This game does allow you to recruit people to help even the odds. I like buying your stuff in stores which predates games like Resident Evil 4. Now I think about it this is more like Saint Rows series in so many ways. Probably the most mind blowing fact about this game is still an tough pill to swallow. The team that made Redneck Rampage series made this. Who later in an new company made Return to Castle Wolfenstein. After playing this following Return to Castle Wolfenstein despite both games run on different engines. You can't deny they're very similar in many areas. This is easily one of the finest among Interplay Build Your Own Bundle. As an kid growing up with many game consoles. I did own MDK on PlayStation never getting far in it. After buying this bundle with my selection, I'm glad I bought MDK again. There are several notable differences between both versions. To me Kurt looks more like an real person in PC version but slightly compared to PS version. I would say PS version does have better controls but I do the PC version controls to an degree. It will take time getting use to but you're in for quite an action pack game. As stated earlier you play as Kurt with the sequel revealing a lot more about him. To sum it up he was an janitor that was forced to become the hero to save the universe from an tyrant. What is Interplay's deal with strange humor & cows? Seriously in just my set alone most of these games has an great amount of both. This was one of the first games to have sniping feature which was new back then. Sadly there is only six levels but each one can take an while to get through. This is one of the best games in Interplay Build Your Own Bundle. An different team working on the sequel to MDK. Usually when an game company changed it's developers. Things get ugly within any fan base that it happens to. Lucky for Interplay, MDK 2 is an exception. You get to play as three characters during the entire game. Each one plays more different than the last as if this were three different games in one. Kurt from the first game is back for more action. Mostly the same arsenal with better controls makes it more fun to play. Max is an machine four armed dog humanoid that loves his guns. Interesting fact in the original MDK, Max was originally named Bones. Honestly Max does fit him better with an new personality. Dr. Hawkin is the joke character whose also an scientist. Most of his arsenal is stuff you find around the house. Sometimes you have to combine things but trust me by doing this. It will save your life many times. As much as it is fun to be Kurt, Max really addicting to play. You can easily switch out your guns at most of the time. Some areas are always filled with them making those much easier. If you are low on ammo in some areas as Kurt, you are screwed. They made the levels shorter but more interesting & better design. Everything works well but it does take time getting use to the controls. I will say this is hands down one of the best games Interplay ever made. I should mention this was BioWare's first game whose widely known for Mass Effect series. An forgotten point & click classic that surprised me it exists for many reasons. This is one of the few of those style games Interplay owns. As of right now the creator of Toonstruck is attempting to make an sequel after all these years. I should mention the main character Drew is played by Chrisopher Lloyd. What's interesting is Lloyd was in an similar movie to this game unrelated called Who Framed Roger Rabbit? Although he was Judge Doom the main bad guy in that movie. Lloyd is the hero of Toonstruck in such an weird game for it's time. I grew up loving slap stick comedy cartoons. They put a lot of thought in everything you can do. Memorizing is required with an great guide or video series. Surprisingly great voice acting with interesting art work for it's time. This game is the easiest in controls within this bundle. But you could easily get loss or confused during it if you aren't careful. You can explore several areas for items & clues to help you an idea where to go next. I highly recommend take your time as often as your patience allows. Toonstruck stands out in other ways too. Wacme is an reference to Acme from the Looney Tunes cartoons. Those two guys are some of my favorite characters. It's an shame they don't play an bigger part in it. Drew becomes likable during the entire game. Flux can be annoying but he sure has his moments. This is an game you could lose if you forgot one thing too many later on. I do recommend this to anyone into those style of games. Now it's time to rank all the games from worst to best. Of course with an line up this good. Everyone will have their own lists but majority should have some in the same places. I hope you guys enjoy this bundle review. They recently did it again with mostly the same selection. But I felt I got the very best & worst of this bundle. I am very happy with my first real purchase on GOG's service. Until next time I'm Jack Red & I'll see all of you later.